Stories and facts and mysteries from my families. Some of my Grinker Mysteries: Who was Chune Grinker? Who was Itzig Cohn in Baltimore? Whence and Wherefore Cincinnati? My paternal grandma arrived in the US at the Port of Baltimore in 1893 on the SS Polynesia, sailing from Hamburg on the Hamburg Line. The upper manifest is the outbound one, in German; the lower is the inbound one, for the US Immigration service of the time. On the manifests her name seems to be “Paula Grinker,” very puzzling. In the US she was known as “Bessie.” Clearly, “Paula” is not a Yiddish or a Hebrew or even a Russian name, either. I think it must be the way that the German purser heard it. The outbound manifest says the family was from Maurico, Argentina, but I have been unable to locate a record of the family’s travel from Argentina to Hamburg; nor have I been able to find an earlier record – probably about a year or so earlier – of the family’s travel to Argentina, presumably originating in Odessa. 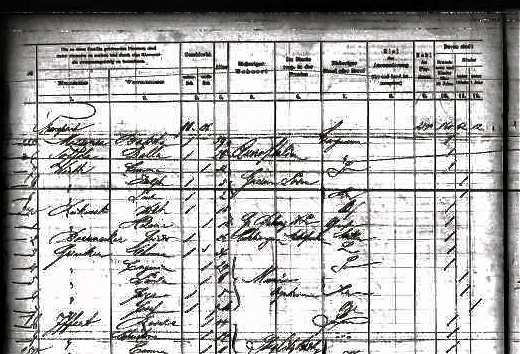 On these manifests there are five people: Chune (known in the US as “John”), age 36, a farmer; his wife, Eugenia (“Jennie” in the US); “Paula,” age 8; Feige (“Fannie” in the US), age 5, and Josef (“Joe”), the new baby. The ages of Paula/Bessie and Fannie/Feige contradict everything else I have found and I believe to be true. Bessie, by all other accounts, was born in August, 1888 and Fannie was born in 1890.
WHO WAS JOHN GRINKER, my great-grandfather? WHO WAS ITZIG COHN, the “cousin” they were joining in Baltimore? WHEN AND WHY DID THE FAMILY MOVE TO CINCINNATI, where they were living by 1897? The first, who was John Grinker, is a multi-part question, because I don’t know where he was really from (Odessa? Germany); do not know the names of his parents or any of his siblings or ancestors; do not know when or where he died; do not know why he left (abandoned?) his family in about 1907, about the time of the birth of his eighth child; and do not know where he went after leaving the family. There are some tantalizing hints, which I’ll discuss in later posts. I was in contact with the Jewish Genealogical Society in Buenos Aires many years ago; I was told that the records of immigrants from about the time John and his family were there just don’t exist now, so it seems that is a dead end. My attempts to discover who Itzig Cohn was, at 130 North Front Street in Baltimore, have been multiple and fruitless. Was he John’s cousin? Jennie’s cousin? An uncle or a friend of one of the families? And I have been unable to locate any record showing that they lived in Baltimore between the time of their arrival, in November, 1893 and the time that I first find a record of them in Cincinnati – in the 1897 Cincinnati City Directory. Where were they during those years? Why did they move to Cincinnati? In tracing my family history, I would like to be able to work backwards – in the case of the Grinkers, find out more about John’s origins; and be able to work horizontally – in the case of John Grinker, find out who his other relatives were, what cousins I might have alive in the world now. Finding out who was Itzig Cohn might help in this regard, if it turns out that he was a blood relative of John’s. The question of Cincinnati is more than mere curiosity, because family history is not just names and dates, but is also the stories of people. Also, answering why they moved could help trace backwards, if it turns out that John took his family to Cincinnati because he had a family member already there. Here, I’ve only scratched the surface of my Grinker mysteries. Name Changes: Was GRINKER originally GRUNFELD?